It’s no longer Star Wars lightsabers and guts on the Star Wars battlefield, but pure wits and skill since this is a war on the chessboard with high quality pieces inspired from the movie. The Star Wars chess set takes heavy inspiration from the movie; in the sense all the 32 figures on your board have representatives from the movie franchise. There is Darth Vader himself, battling it out with Han Solo. Other characters featured on the chess set include Boba Fett, C-3PO, R2-D2 amongst others. 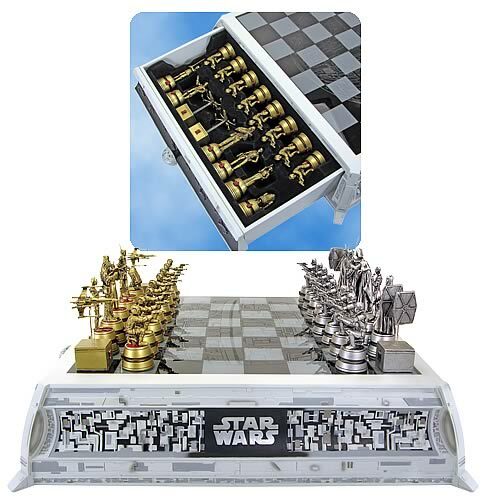 The chess set per se is a work of fine art, the attraction offered by the ‘Star Wars’ brand notwithstanding. There is a generous dose of gold and silver sprayed across, replacing the traditional black and white figures. The best part is that you do not have to know a lot about the movie to play; your skill (it’s chess, of course) is enough to triumph over your nemesis. So, even the presence of Darth Vader cannot intimidate you. Legend-bashing aside, the casing on the board is made of durable MDF and polyresin, while the base of the board has glass etched on to it. The feature we loved most, of course, is the slide out drawer that can store your chess pieces when there is a battle-break. It might be a tad expensive at $599.99, but for connoisseurs and enthusiasts, this might perhaps be a small price to pay. For more Star Wars, check out the Darth Vader USB Hub, the Jango Fett Cake or the Limited Edition Lightsaber.